It's that time of year when there seems to be an endless pilgrimage from one house to another. For gift drop offs, get-togethers, holiday visits or full on parties there is always somewhere to be during the holidays. Now, this will differ depending where you call home, but in most parts of Canada the holidays also come with a side order of white stuff- aka snow. It's cold, it's wet and it can be totally messy and not all that fun to deal with, especially when it creeps up your legs and into your shoes. Luckily, there's Kushyfoot! Now, they can't melt all the snow- unfortunately- but they do have two products that can defiantly be helpful this time of year. Read on! 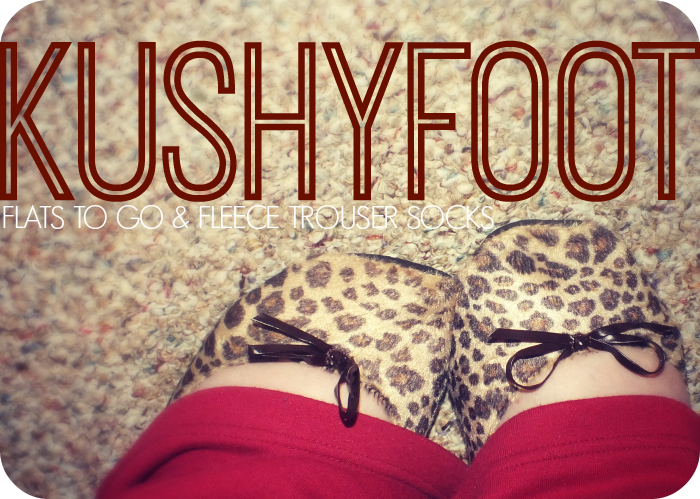 First up, are Kushyfoot Fleece Lined Trouser Socks. These are hands down the softest socks I've ever worn! They're super soft, fleece lining is not only comfy, it also keeps you toasty. They're excellent in the fact that while they do have a fleece lining, they are still fairly thin, so they'll work to keep you warm but aren't bulky and will fit into any type of shoe/boot. Since these are trouser socks, you get lots of length to pull them up keep your legs protected. They have a really comfortable elasticized top that is perfectly stretchy- to fit any sized leg- and doesn't dig in, meaning you really can wear these for hours. They are soft on the outside as well, which feels quite nice, but I do find them to be slippery- even on carpet- so you'll want to be careful or be sure to have a slipper or shoe to slip on if you're on the go. Also, these seem to just be a shortened version of their fleece tights, as there is no shaping- ie. rounded toe or ankle seam- so you end up being able to really feel the toe seam and get that square toe look. Nothing major, just worth noting. 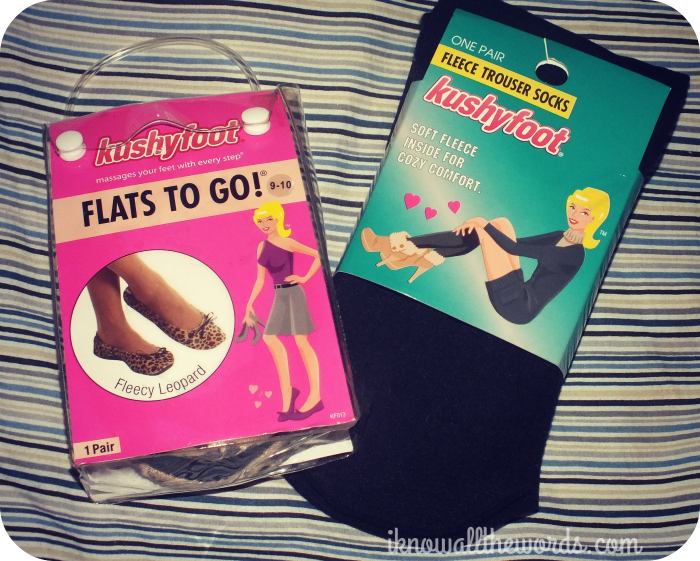 Speaking of on the go... Kushyfoot Flats to Go are the perfect item to have stashed away in the bottom of your purse. When the weather is minus god-knows-what and the snow is five feet deep you've got to go for function over fashion these are super handy to be able to pop on when you reach your destination. Of course, they're also great at any time of year, if you find yourself in uncomfortable shoes half way through the night. Nothing can crash a party faster than sore, achy feet. Kushyfoot Flats to go come in a variety of different colours and patterns and come in a re-useable plastic pouch for easy storage. The flats easily fold in half- making them about the size of your hand- and are light weight. 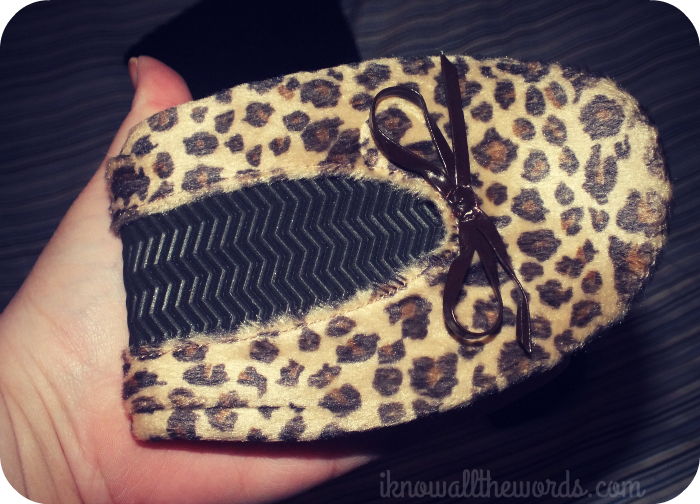 The inner soles have a texture chevron pattern to massage tired feet for added comfort. I found them to be really comfortable and love that I can stash them away for anytime they may come in handy. Overall, you can't really go wrong with either of these products. Kushyfoot products are available directly from Kushyfoot and at various drugstores and big box stores.